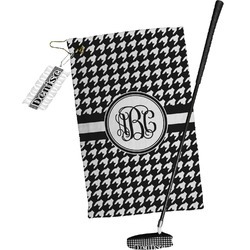 Our Golf Towel Gift Set is the perfect personalized gift for the stylish golfer. It should theoretically improve their game because each time they clean the golf balls, tee off or putt, the personalized gift set should make them smile! So buy one as a gift and don't forget yourself, it may also improve your game! One 11x18" fully printed/patterned golf towel, with grommet and a pear clip in the top left corner. Towel is full color on front; white on back. A neoprene putter cover that measures approximately 5" x 2.25" and it designed to fit the traditional blade style putter. Putter cover is printed on top and black on bottom. A plastic tee & ball marker that comes with a ball chain key-chain and includes 12 plastic tees and 3 plastic ball markers. We have 100's of designs to choose from - so whether you are looking for something feminine or masculine or are looking to put your logo on it - we have you covered. You can also design your own gift set. We have thousands of patterns in our system that you can use. Your can also upload you logo and/or design. Contact us if you need any assistance. Golf Towel, putter cover and tee & ball marker are all also sold individually.